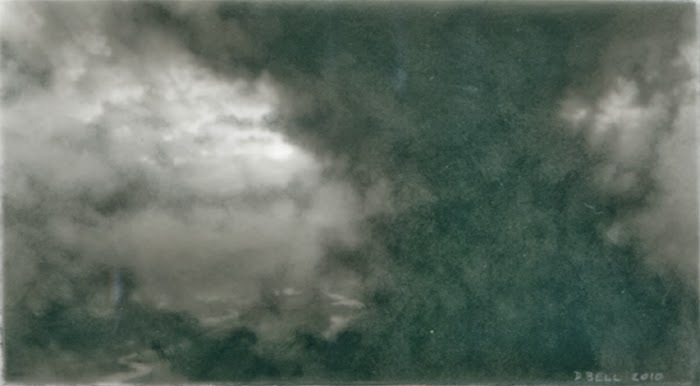 Dozier Bell, Burg, 6:00, 2011, 2.5 x 5 inches. Dozier’s Bell’s imaginary landscape drawings comprise a vision of nature that sweeps across vast plains and valleys, ascends into lofty skies, and reaches toward far distant horizons, its range seemingly boundless, its scale undeniably majestic. The vision often pictures nature at dawn or dusk, its light generally dimmed and pale or momentarily darkened by clouds, its expanse sometimes broken only by a first or last glimpse of the flashing sun, its temper otherwise solemn, even troubled, as if brooding. 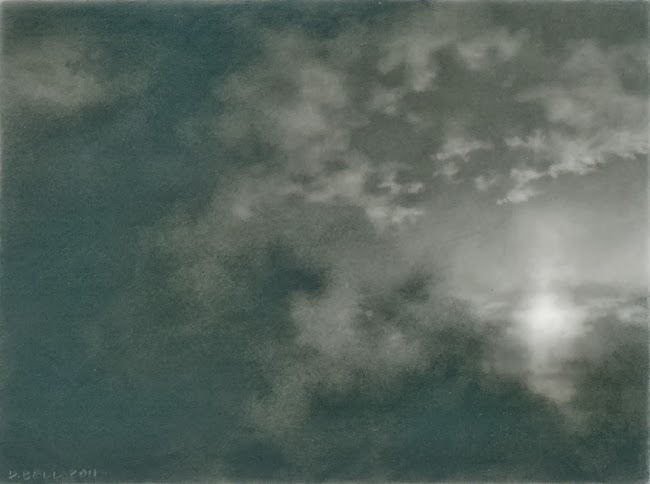 The drama we observe in these panoramic images is evident in the ever-shifting cloud formations and constantly changing light they record, their restlessness making visible the conditions that obtain when the atmosphere suddenly warms or cools, fronts collide, and weather threatens. Dozier Bell, Column, 2, 2010, 2.5 x 4.4 inches. 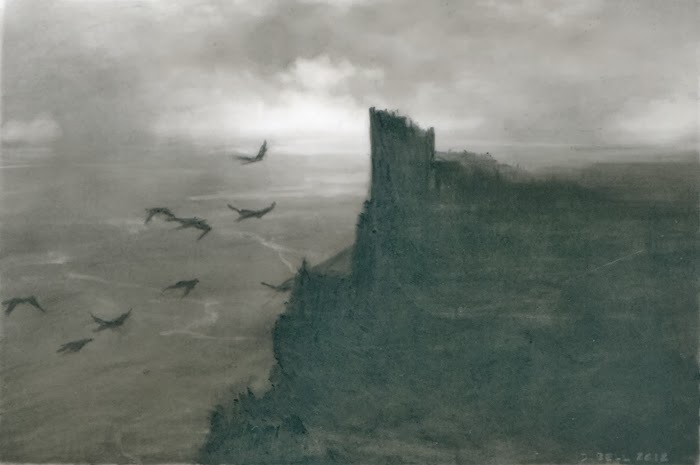 As beholders, we view Bell’s fictive worlds from an elevated position, as if from a parapet within a medieval castle or citadel--like the ones we see silhouetted on a ridge or stone outcropping in several of the distant landscapes spreading before us. 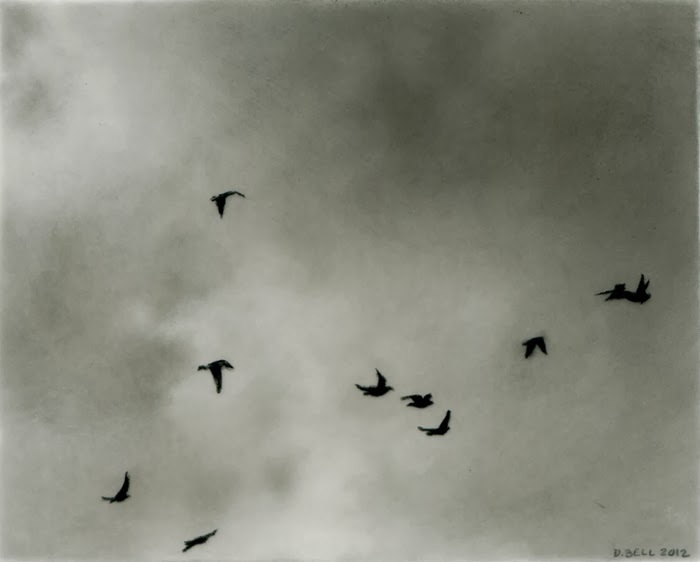 We occasionally see a bird in flight, but no human figures. We hover above the landscapes rather than feeling planted within them; though emotionally gripped by the events we see, we feel detached from their physical thrust. And thus is a cautionary note sounded, for nature is here signaled as other, as a force unto itself, a force separate from us, and indifferent to us--a force from which we may withhold acknowledgment, but at a risk for which we alone bear responsibility. Fictive the landscapes may be, but the close observation that everywhere informs their realist impulse firmly secures their credibility and grounds their compelling artistic achievement within an equally compelling concern for their subject, the environment we precariously inhabit. 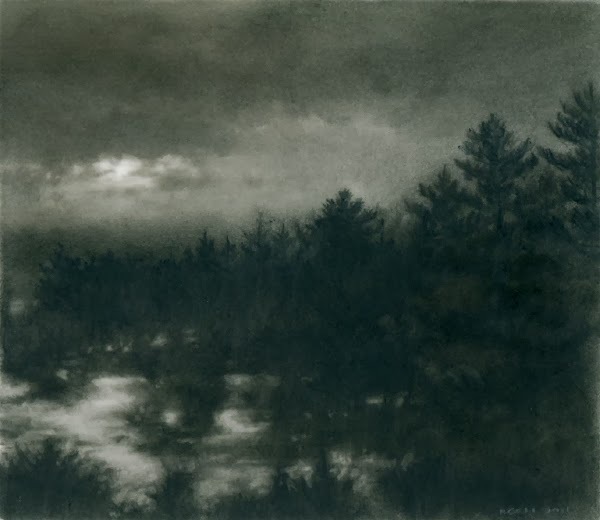 Dozier Bell, Field's Edge, Twilight, 2011, 3.5 x 4 inches. 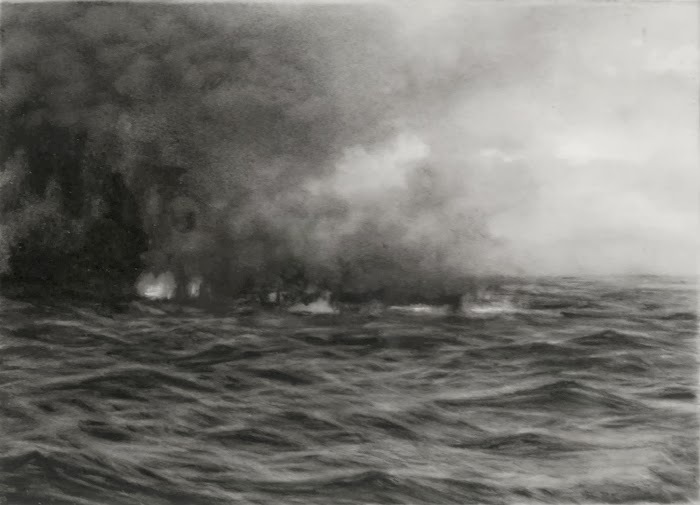 Bell’s drawings--they’re all charcoal on mylar--are noticeably and resolutely small, on average between three and five inches on a side, small enough to hold in the palm of your hand, like a postcard, or a cell phone, or an iPod, or, even when framed, something still easily handled, like an iPad. All of which means size is purposefully a function of their content, as it’s been from time to time in art in the past. As it was, for instance, with the Abstract Expressionists who regularly produced oversized paintings, not first of all to express the might of American painting, a plausible suggestion, but to achieve intimacy--to physically engulf us in their worlds and thereby enable us to become one with them. Dozier Bell too seeks intimacy, but hers accrues to our holding close her miniature landscapes, rubbing our nose in them, not to control what we see, a possible but vainglorious fantasy, but better to absorb their content and to gain thereby a fuller understanding of nature’s scope and bounty. Dozier Bell, Flight, 2011, 3.5 x 4 inches. In a world where we are regularly inundated by rapid-fire media images competing for our attention, a world where other worlds are routinely and instantly available to us via objects we hold in our hands and constantly consult in our urge to feel connected--social worlds of information and images and texts and entertainments--Bell’s diminutive worlds are exceptional in not actively competing or being social at all. Anchored in nature and observing nature’s rhythms, acknowledging nature as source and solace without reliance on media intervention, her worlds are secure with their autonomy. Theirs is a decidedly slow art, an art imaging nature stilled in order to enable contemplation, an art by which our response is patiently measured yet at the same time deeply rewarded--in the one-on-one intimacy shared in the tiny worlds’ embrace, in the abundant visual pleasures they offer our enchanted gaze. That so much can be said in so little space is a source of wonder--not at technology, but at art. Dozier Bell, Flock, 6, 2012, 3.4 x 4.1 inches. Art’s history echoes in these drawings. Shaped by feeling yet informed by fact, they resonate a strong awareness of the pre-Impressionist landscapes of the early 19th Century--the landscapes of Casper David Friedrich and John Constable, for instance, from which they seem remarkably able to have taken inspiration in equal measure. The hushed valleys, the shrouded light and the far away castles that momentarily focus our attention acknowledge kinship with Friedrich’s spiritual quest and the northern romantic tradition which his pictures quintessentially define. Likewise, the action in the skies that Dozier Bell has so clearly and closely observed and recorded is in kind the action that characterized Constable’s studies of nature and moved him to declare, “It will be difficult to name a class of landscape in which sky is not the key note, the standard of scale and the chief organ of sentiment.” Moreover, we can track these dual art historical threads into the present, to Abstract Expressionism in the 1950s, to Mark Rothko and Clyfford Still, for instance--to the former’s vaporous fields of elusive cloud-like color space, to the latter’s jagged and obdurately physical expanses of troweled pigment. Feeling and fact, romantic and classic, mind and body--the threads have been variously identified in modern art and thought, at times individually, as if in opposition to each other, and at times as necessary to each other, in mutual support. That they are vitally linked in Bell’s drawings is a mark of the drawings’ distinctive achievement, while their union may additionally tell us something about the way we live now. Dozier Bell, Roost, 2012, 3.25 x 4.75 inches. Which was not something we necessarily asked the art of Friedrich and Constable or Rothko and Still to do, nor did we ask it of modern and modernist art generally. Through the first half of the 20th Century we asked first of all about art’s formal originality, because that’s where the most compelling art of the time was focused. The formalist approach that in turn came to dominate art discourse was altogether understandable. Gripped by the pictorial exploits of Picasso and Matisse and their descendants, we regularly felt pressed to first make sense of what was happening right before our eyes, in the space and light and color we could see and point to, leaving until later whatever additional layers of meaning might be revealed when the dust initially stirred by their exploits had settled. Which already began happening during the 1960s, as art turned its attention outward with Pop and earthworks and photorealism, and the pattern continues unabated today, as art diversifies its practice and becomes global in its reach. In response we increasingly seek information about the particular times and places and people who make the art of our time in order to position it and them in some kind of cultural context. Thus has formalism yielded to sociology and art become measured by questions about how much it says about being alive here and now, then and there. Dozier Bell, Smoking, 2010, 3 x 4.25 inches. 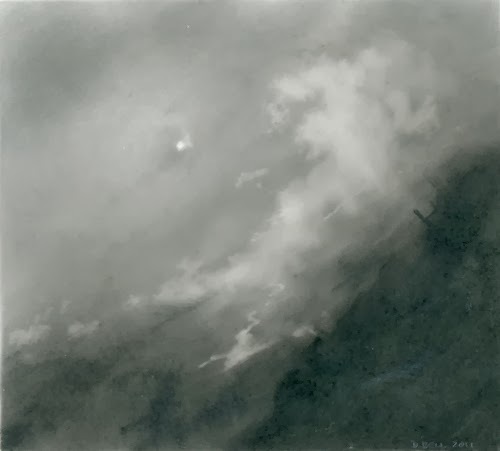 Dozier Bell, Updraft, 2010, 3 x 4 inches. Dozier Bell’s drawings answer those questions with couplings dynamically balancing passion with intelligence, form with content, and our cultural present with our cultural past, couplings informed by the vision of an artist who is also an environmentalist, couplings voiced with conviction and authority that spur thoughts about the natural world around us, about what our relationship to it currently comprises, and about what that relationship ought to comprise in order to sustain and allow it to be the best of all possible worlds in the future. For the way we live now her art, like all art of genuine consequence, spreads before us bearing urgent moral implications. I was in Chelsea today and went by Danese Corey gallery with a friend I bumped into. I asked if I could see some of Dozier Bell's drawings and Carol Corey was kind enough to show us about a dozen of them. You are so right. They were magical and just exuded light. Great move, I'm glad it paid off. I initially saw the drawings on Facebook but was subsequently able to see them in the flesh when Dozier and her husband, Ken Greenleaf, came over from their home Down East for a visit. Magical indeed! I saw these on display at Bates College in Maine some time ago, and this essay captures so much of their enchantment. As always, Carl hones in and articulates what is extraordinary and singular about these delicate, evocative pieces.